Gotta Tango is a superior instructional package for learning how to dance the authentic Argentine tango at a social level. Master teachers Alberto Paz and Valorie Hart take you on a journey through the rich culture, history, and music of Buenos Aires. Over 7,000 copies sold around the world. 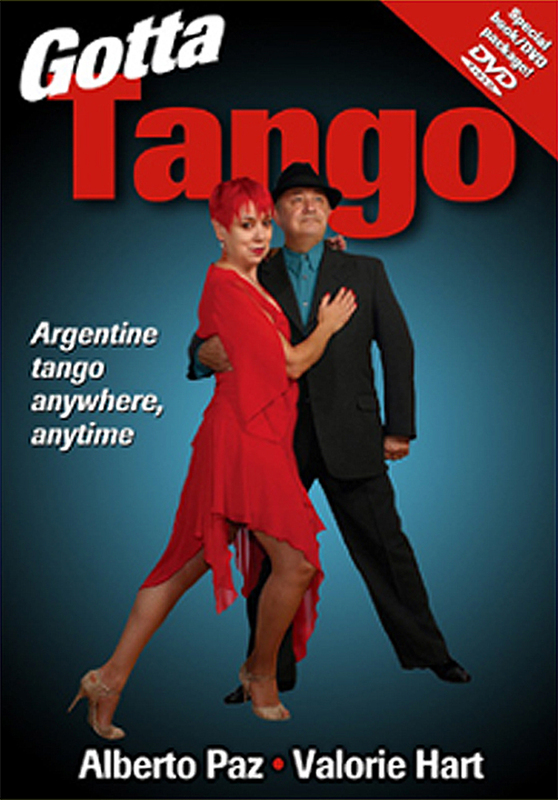 Can you not afford to have your tango dancing’s Owner’s Manual? Nobody is born knowing, but studying we learn, as long as what we learn makes sense and can be explained in clear and logical terms. As a student, or a teacher, you deserve to know the facts. Get it, love it, share it. Click HERE for special offer. The tango lyrics page in Spanish with English translations was created by Alberto Paz for the purpose of preserving, nurturing, and advancing the education, understanding and love of the Argentine Tango culture through the poetry of its verses . You are welcome to enjoy it, share it, broadcast it, never forgetting who deserves credit for the wealth of information contained herein. Your comments, contributions and critiques are always welcome. Los felicito por este excelente website. Quisiera hacerles una consulta. Me gustaria saber el nombre del tango que en parte de su letra dice asi: “Hoy se que te encontras sola y vencida/ ocultando una pena en tu vivir,/se que te persiguen recuerdos de mi amor./ Se que te hace falta valor para volver./ Con los brazos abiertos yo te espero,/ veni porque te quiero igual o mas que ayer”. Apreciaria mucho si me pudieran dar una respuesta. Arrepentida. It’s no a tango though. 5.El tango se llama “Arrepentido”. El autor es Rodolfo Sciammarella. As always I am very grateful for the tango lyrics resource. I often access the new website on my I Pad. The lyrics pages display well, but the index is too wide and the last column is not accessible on iPad. Can you find out what’s the screen’s width in pixels for the iPad?, please? Greetings from San Anselmo, CA (just north of San Francisco)! mine may be less. The other pages display properly, just not the index page, so if you can use the same settings as your other pages, the index page will display properly. I think that the changes we made should do it. Muy buen trabajo! Los felicito. thank you for all these lyrics. I wonder if anos de soledad by astor piazzolla has any lyrics too ? Gracias, gracias por los gratos recuerdos de aquellos momentos en que la musica de tango engalano mi vida con sus romanticas liras y hermosa musica. Que rico es ser latino para poder compartir esta bella cultura que nos une. Hi! First of all, I’d like to congratulate you for your website. It’s really interesting. I’m writing my thesis on translation of tangos into English, and how to deal with all the aspects that are key to Argentinian culture, and I’d love to get in touch with the translator of this lyrics to ask him about how he got inspired to make the translations and to create this website. Gracias por las palabras tan amables y felicitaciones por la tesis. El proyecto de las letras de tango en ingles y castellano empezo por un deseo de difundir la cultura porteña y expandir el entendimiento de la poesia del tango a aficionados foraneos. Originalmente se trato de establecer un foro abierto para que otros pudieran contribuir sus propias traducciones, pero poco a poco se seco la inspiracion ajena y la tarea recayo en Alberto exclusivamente. Estoy organizando un taller de letras de tango en Inglaterra. Porfa contactame.. Se olvido de los amigos? Como le fue en su taller? Aqui le va El sol del 25. Que lo disfrute sin antes recordar que no es un tango sino un gato. all you spanish speaking that sing along while dancing! here are some good ones! Ya esta. Que lo disfrute. Este site es fantastico! Estoy interesada en el titulo y la letra completa de “Adios Muchachos”‘ no me puedo acordar del nombre! Tengo una grabacion casera de Julio Soza pero sin titulo. Gracias! Muchas gracias por sus palabras tan amables. Con respecto a su pedido quiero informarle que el tango que menciona es simbolo de mala suerte, yeta, y otras malas yerbas. Por lo tanto los entendidos no lo nombran, no lo cantan, no lo pasan en el estereo, y si por casualidad alguien lo pone sin saber de su significado, los hombres usan una mano para proteger los genitales y las mujeres un pecho para ahuyentar la yeta que el tango trae. Una vez en este sitio puede hacer la busqueda con las palabras que usted menciona. otra vez gracias, esta vez por la informacion, que creo que ya es demasiado tarde, porque creci escuchando este tango. De todas maneras, y como decimos en el Medio Este, HAMSA, HAMSA,HAMSA!! Clavaste sin temor con toda el alma a traición y por la espalda un puñal y para que, no ves que estoy herido y te sonrío, hoy te llamo cielo mio que aun beso tu puñal, no lo ves que pese a todo y contra todo en el cielo y en el lodo yo te quiero siempre igual. no lo ves que pese a todo y contra todo en el cielo y en el lodo yo te quiero siempre igual. Italian singer Milva has another lyrics for song El Choclo. And I could not find any word for this version. If you have any idea please let me know. The title of the song Milva sings to the tune of El choclo is called All’Osteria. I don’t know where to get the Italian lyrics. Thank you for yor response. Yes, you right she sings in Italian. I could find approximate text, so if someone knows Italian and could correct this it Iwould really appreciate. perché ha aderito all’etichetta a PERFEZIONE…. ?? ?, a voied esso è in pubblicazione, dato che non per i problemi ………. nella gente della pubblicazione non ha divertimento e pochi soldi là sono sufficientiper comprare tutti i sogni, che non sono per la vendita ed il più luxurious dei ristoranti, in pubblicazione TEMPO i passaggi IN FRETTAe là è uomo egli stesso, che a ??? ………. nella volontà mai i problemi e la persona limita in se della pubblicazione. Con che cosa poche, che abbiano ………. dei nella ristoranti più eleganti e maggior parte più di lussolà sono sempre la g?? Quisiera conocer grabaciones del tango “Sinsabor” y otros tangos de los Donato, por orquestas diferentes a la de Edgar Donato: gracias por su atención. No creo que existan ya que esas orquestas trataban de tener repertorio propio. i WOULD LIKE TO KNOW WHO WROTE THE OPERA EL TANGUITO AND WHERE IT IS AVAILABLE. Marcelo Piñeyro wrote Tango Feroz, the story of Tanguito. Osvaldo Pugliese la grabo con Alberto Moran. Miles de recuerdos con lagrimas peleando por asomarse. QUERIDA ARGENTINA QUERIDOS ARGENTINOS: Quisiera ver la letra del tango “que se vaya. FELICES FIESTAS PARA TODOS. Un millón de gracias por vuestra estupenda ayuda a recordar tiempos que jamás volverán. No sirve pa´ nada… ¡Repita patrón! Si soy derecho, si me sé comportar. Nuevamente con ustedes. primero para agradecerles por la letra “Que se vaya”. la Directora de nuestra institució Espiritual. también se lo agradece. Ahora tengo dos o tres pedidos más: Como con bronca y junando, Rodriguez Peña,y otro que dicce: Luna, lunera, cascabelera. Más adelante les explicaré con detalle, en que paso mi tiempo, o sea en que paso mi tiempo. Muchísimas gracias, y que DIOS se lo pague. Otra vez yo. Perdonen algunas repeticiones. Recuerden que tengo 88 Mayos, pero aun me avergüenzo. I would like to find a translation into English of the lyrics for “Arrabalera”, rather difficult to translate, but if anybody knows of it, I would be most grateful. Best wishes, Francisco. Thank you for the excellent website: I have used it for a few years now, in my teaching of Tango history. Can anyone translate the lyrics for ‘Balada Para Mi Muerte’? They are difficult, and I’m dying to understand them! Thank you! Gracias a ustedes pude mostrarles a los neozeolandeses amantes del tango de que se trataba esto que tanto bailan. donde puedo encontrar “la puñalada”? great idea thank you very much for your translations. It would be great having “Fueron tres anos” by Varela…. Ciao, I really appreciate your work, it has been very useful during my tango and not-so-tango relationship with my current tango-partner (soon to be something more, I hope…). I used several of your translations together with the music file to further the courtship via e-mail, you have been of great help! I wanted you to know that with this small change the translation is “PERFECT” and did convey the right message to my tango-could-be-something-more-partner. I translated into Italian and English “No me hablen de ella” by Hector Varela, you find the translation at http://www.tangoitalia.com/fabrizio_de_andre/no_me_hablen_de_ella.html, feel free to add it to your site. Cool, I’ll give you credit if you don’t mind. Tango, tango, I love to dance! Thank you for the manual. I’ll be traveling to Argentina in about two months. Now am counting days before the trip starts. The country of tango. soy mucho tiene!!! que es no working con mi? I would like to know the English translation of Flor de Monserrant (spelling?) for both verses. Thank you! I was wondering if you published a little book with these lyrics.